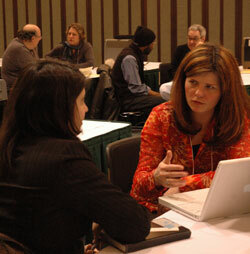 As a CAA member, you have access to a diverse range of mentors at Career Services during the 103rd Annual Conference, taking place February 11–14, 2015, in New York. All emerging, midcareer, and even advanced art professionals can benefit from one-on-one discussions with dedicated mentors about artists’ portfolios, career-management skills, and professional strategies. You may enroll in either the Artists’ Portfolio Review or Career Development Mentoring—please choose one. Participants are chosen by a lottery of applications received by the deadline; all applicants are notified of their scheduled date and time slot by email in early 2015. Both sessions are offered free of charge. Conference registration, while encouraged, is not necessary to participate. All applicants must be current CAA members. The Artists’ Portfolio Review offers CAA members the opportunity to have digital images or DVDs of their work reviewed by artists, critics, curators, and educators in personal twenty-minute consultations. Whenever possible, CAA matches artists and mentors based on medium or discipline. You may bring battery-powered laptops; wireless internet, however, is not available in the room. Sessions are filled by appointment only and are scheduled for Thursday, February 12, and Friday, February 13, 2015, 8:00 AM–NOON and 1:00–5:00 PM each day. To apply, download and complete the Career Development Enrollment Form. Send the completed form by email to Lauren Stark, CAA manager of programs; by fax to 212-627-2381; or by mail to: Artists’ Portfolio Review, College Art Association, 50 Broadway, 21st Floor, New York, NY 10004. Deadline extended: January 9, 2015. Artists, art historians, art educators, and museum professionals at all stages of their careers may apply for one-on-one consultations with veterans in their fields. Through personal twenty-minute consultations, Career Development Mentoring offers a unique opportunity for participants to receive candid advice on how to conduct a thorough job search; present cover letters, CVs, and digital images; and prepare for interviews. Whenever possible, CAA matches participants and mentors based on medium or discipline. Sessions are filled by appointment only and are scheduled for Thursday, February 12, and Friday, February 13, 2015, 8:00 AM–NOON and 1:00–5:00 PM each day. To apply, download and complete the Career Development Enrollment Form. Send the completed form by email to Lauren Stark, CAA manager of programs; by fax to 212-627-2381; or by mail to: Career Development Mentoring, College Art Association, 50 Broadway, 21st Floor, New York, NY 10004. Deadline extended: January 9, 2015.